September 20, 2017 — The man was dressed in a red unitard that left nothing of his muscular body to the imagination. His arms were cruelly shackled behind his back by thick chains that also looped around his neck. He was surrounded by crowds of men in bowler hats and women in floor-length dresses. It looked like an execution. 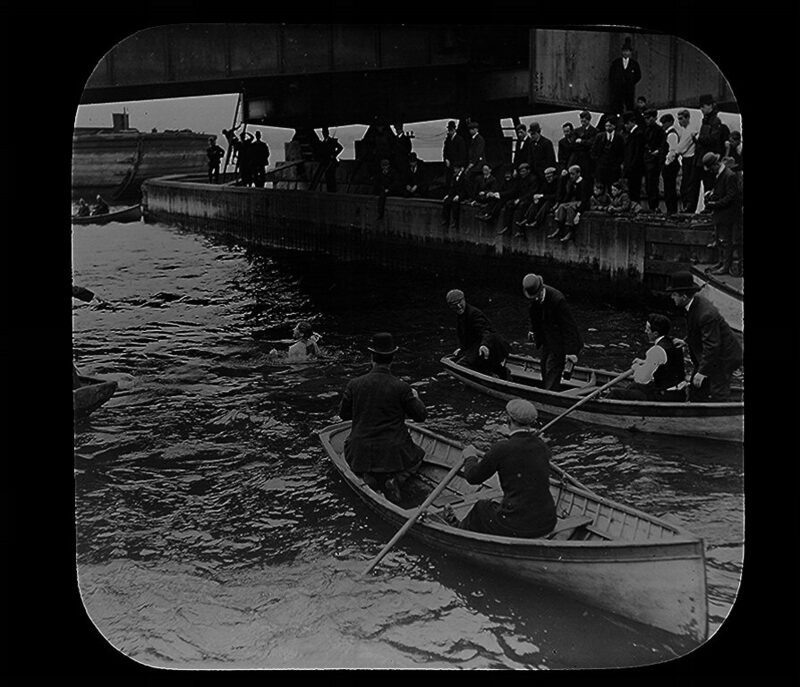 Especially when that man jumped off the bridge 30 feet down into the freezing waters of the river below. 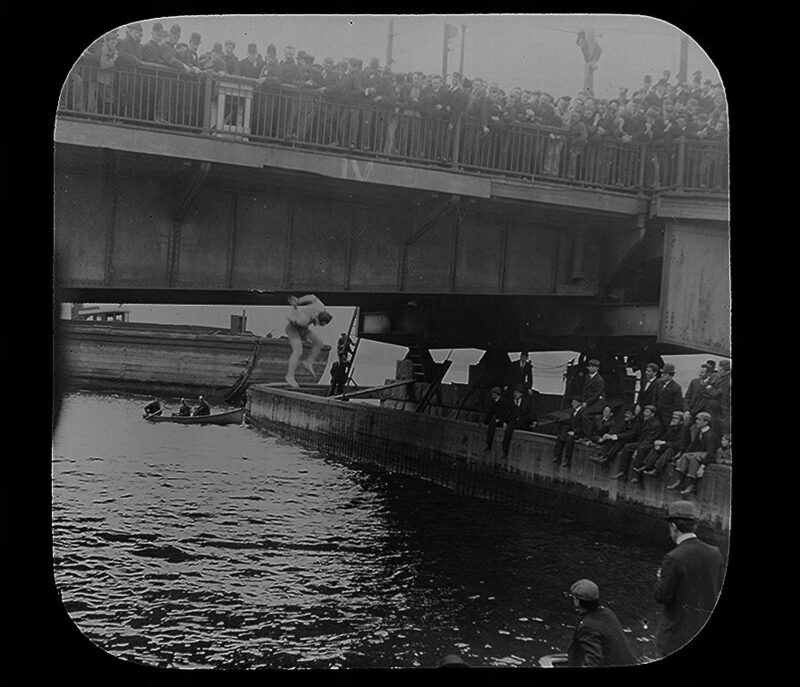 Less than a minute later, though, he surfaced, chains in his hands and exultant, hallowing the bridge for all time as a Houdini site. That’s right. The man was Harry Houdini. The year was 1908. And the bridge was the Harvard Bridge in Massachusetts. 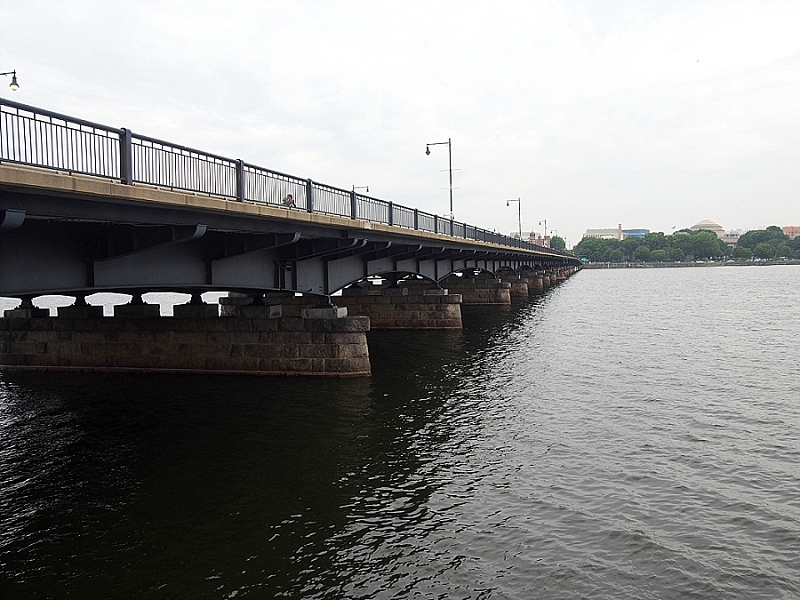 The Harvard Bridge, also known as the Mass Ave. Bridge since that’s the road that it keeps from getting wet, is a half-mile span over the Charles River that connects the cities of Boston and Cambridge. Construction began on the original bridge in 1887 and ended in 1891. In the late 1980s, it was rebuilt, although the builders kept the original “granite piers and abutments.” The bridge is locally famous, but not for the man who leaped from it. It’s for the man who laid down on it. In 1958, one of MIT’s fraternities decided to measure the bridge using their shortest pledge. His name was the absurdly satisfying, Oliver Smoot. He was 5’7”. Turns out, the bridge is 364.4 “Smoots” long, give or take an ear. So he laid down on that bridge 365 times. I think I’d rather jump off it in chains. Smoot would go on in his post-MIT years to become president of both the American National Standards Institute and the International Organization for Standardization. The guy just…measured up. I approached the bridge from the Cambridge side and, there, inset into a cement pylon was a steel plaque that told the story of Smoot and his short career as a measuring tape. 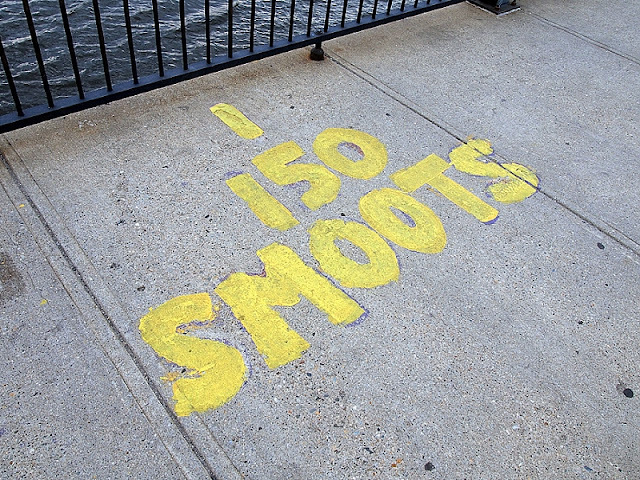 As I walked across the bridge, I saw increments spray-painted into the sidewalk, marking off the number of Smoots that I had walked: 150 Smoots, 200 Smoots. And I did all the Smoots, because I was headed to the opposite side of the bridge, the Boston side, to find a different plaque. That plaque was for Houdini. Or Erich Weiss, since punching things in bronze demands real names. 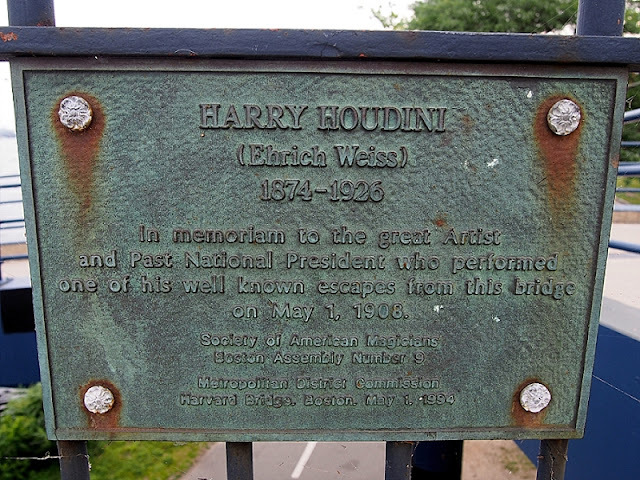 It was put up in 1994 by the Boston chapter of the Society of American Magicians, an organization that Houdini himself had been president of at one time. 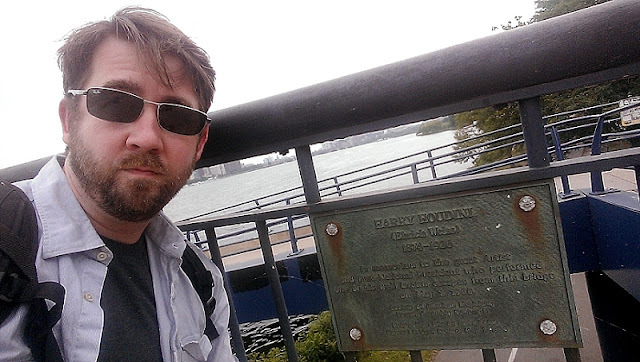 I found the plaque at the end, on the eastern side, which is the approximate area and the exact side of the bridge from which Houdini flung himself. There’s an error on the plaque, as it dates that jump to May 1, when it actually took place the day previous, on April 30. 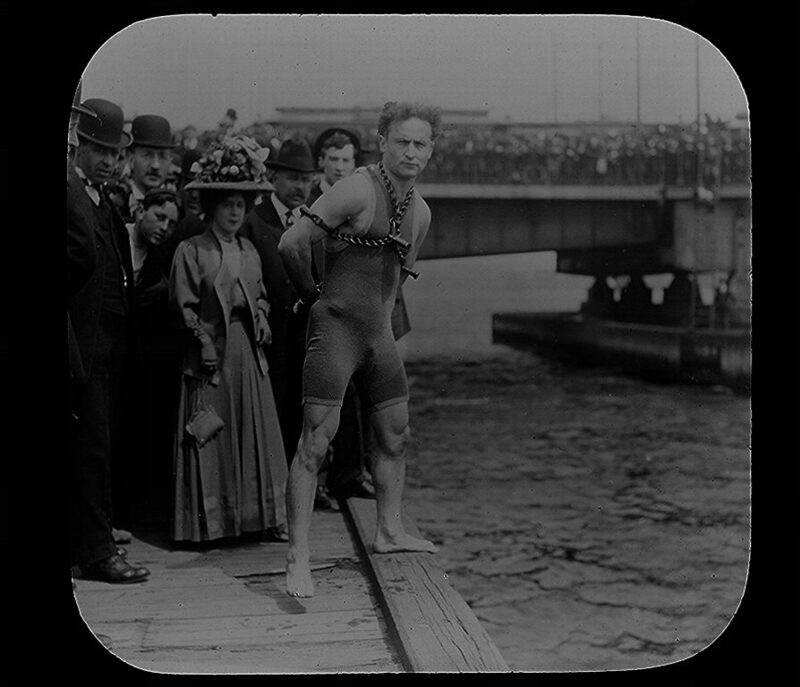 Jumping off bridges in chains or dangling in the air in a straightjacket is how Houdini did PR. No mere email press release for him. He was in Boston to perform at the Keith’s Theatre on Washington Street, and he wanted people to know. And to create buzz for the next city on his tour. Unfortunately, Keith’s doesn’t stand anymore. But that’s okay. We have the bridge. Or at least the granite piers and abutments. An amazing series of photos documents the event. In the first, Houdini stands defiant on the Boston side of the river, his wife in a flowered hat behind him. The next photo catches Houdini halfway down his jump, with him already working on his chains before he hits the frigid liquid. Finally, his head bobs triumphantly above the surface of the river, as dapper gents in canoes row out to retrieve the daring, famous man with the symmetrical hair, ensuring that Detroit would be the eventual site of his death instead of Boston. Every Halloween, Houdini is remembered for that death, since he died on that holiday in 1926 in a hospital that, like Keith’s Theatre, no longer stands. And for promising to try to return from the grave. Every October 31, people hold seances to try to lure him back to the land of the living. But they should really try it at the sites of his great victories. Like Harvard Bridge.